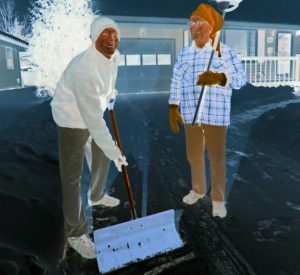 West Fargo, ND – One tip the FM Observer would like to share with our beloved readers is to get out and do some pre-shoveling prior to a winter storm. What is pre-shoveling, you may ask? Pre-shoveling is proactively doing some of the inevitable after-storm shoveling that you’ll have to do…but prior to the snow event. Not only is it much easier than post-storm shoveling, but it will also impress your neighbors, and show them that you care and that you read the FM Observer. Pre-shoveling is also a good idea prior to the first snow storm of the year because it will help you locate your shoveling equipment which is prolly still up in your attic next to your Christmas tree stand.